Despite an Israeli ban on her movement, Palestinian resistance icon Ahed Tamimi traveled to France, for a debate, on Friday. The young resistance leader was invited by L’Humanité newspaper and the French Communist party, or PCF, to participate in an event organized by Association France Palestine Solidarite. Ahed spoke on Sunday, at the Fete de L’Humanité (Festival of Humanity) which is organized annually by the PCF and its newspaper L’Humanité at La Courneuve in Seine-Saint-Denis. “I want to say to Trump that Jerusalem will remain the capital of Palestine”, Ahed Tamimi said, in reference to the decision of the U.S. president to move the U.S. embassy from Tel Aviv, addressing thousands of people who attended the last day of the event. The 17-year-old teenager from Nabi Saleh village, in the occupied West Bank was jailed for eight months for slapping two Israeli occupation soldiers who were harassing her family at their home’s yard. Her action, in December of last year, was recorded and went viral on social media. attracting applause from the supporters of Palestinian resistance globally, while also infuriating Israelis some of whom asked for her to be shot and killed. Ahed and her mother, Nariman, both had been jailed in an Israeli prison since December of 2017, before receiving a few weeks early release in late July. 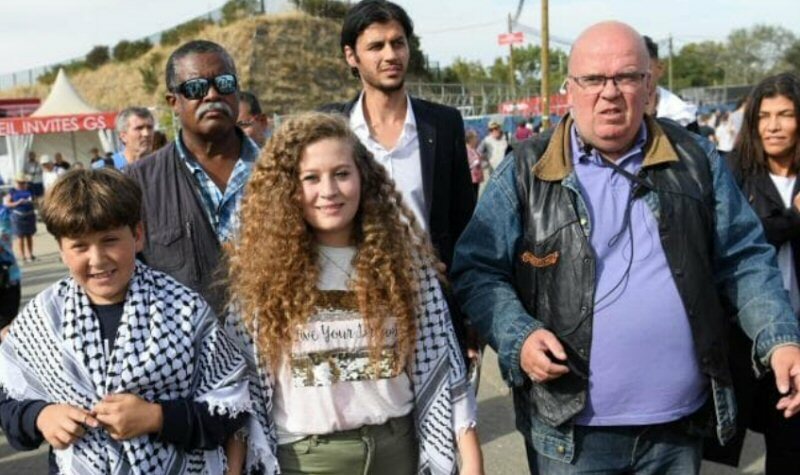 Ahed received a warm welcome from the people gathered at the event, in France, where she talked about how her life has changed during her imprisonment. The young resistance icon doesn’t regret her actions and said that prison helped her to be more mature. Immediately after her release, while speaking to media, she said she and her other inmates studied international law in the prison. Speaking to RT during her trip in France, the young Palestinian activist said that despite being released she does not think that she is out of trouble as each of her words can be used against her and land her in prison again. She further called for boycotting the Israeli state and asked people to spread the truth about the suffering of Palestinians, due to Israeli occupation. The news of her France visit comes just a week after she was informed by Palestinian authorities that she was not allowed to leave the country, due to an Israeli ban on her and her family from doing so. Her father had said that they were not given any definite reason for the ban. Ahed is now expected to travel through Europe to talk about Palestine’s resistance and her time in Israeli prison. Her next stop will be in Spain, to participate in more solidarity events.